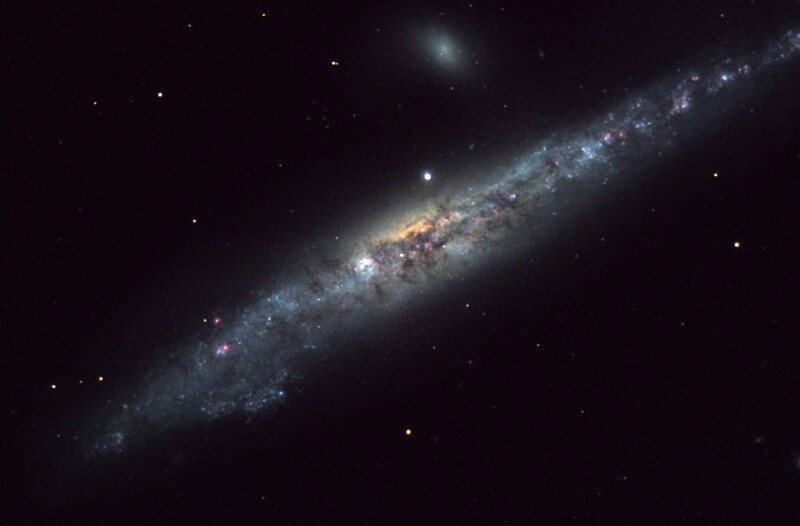 Explanation: NGC 4631 is a big beautiful spiral galaxy seen edge-on only 25 million light-years away towards the small northern constellation Canes Venatici. This galaxy's slightly distorted wedge shape suggests to some a cosmic herring and to others the popular moniker of The Whale Galaxy. Either way, it is similar in size to our own Milky Way. In this gorgeous color image, the Whale's dark interstellar dust clouds, young bright blue star clusters, and purplish star forming regions are easy to spot. A companion galaxy, the small elliptical NGC 4627 appears above the Whale Galaxy. Out of view off the lower left corner of the picture lies another distorted galaxy, the hockey stick-shaped NGC 4656. The distortions and mingling trails of gas and dust detected at other wavelengths suggest that all three galaxies have had close encounters with each other in their past. The Whale Galaxy is also known to have spouted a halo of hot gas glowing in x-rays.